You helped Save Squak from logging and become a part of our park system for us and future generations to enjoy. But the work isn’t done yet! Before the new park can open to the public, the old campground must be cleaned and restored. Join TPL & Your Neighbors! Whether you’re an individual, family, group of friends, or corporate group, TPL needs your help creating King County’s newest park! Whether you’re an individual, family, group of friends, or corporate group, we need your help creating King County’s newest park! Help us prepare this new park by cleaning up former campsites and replanting native species. Only 20 minutes from Seattle, this open space on Squak Mountain will soon be open to the public for hiking, birding, and exploring. This event is free and family-friendly. 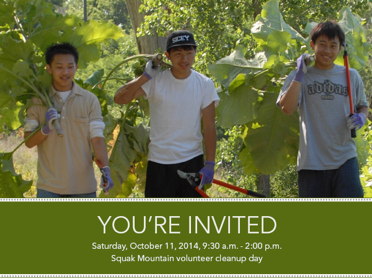 Volunteers will receive a t-shirt, other Trust for Public Land goodies, and a delicious lunch provided by Chipotle. Space is limited. Please RSVP for details and directions by October 6, 2014, to Mahima Singh, mahima.singh@tpl.org or 206.274.2929. This entry was posted in Announcements and tagged King County Parks, King County Purchase, Preservation, Trust for Public Land by admin. Bookmark the permalink.